"Mystery Train" is a solo acoustic recording that was originally released in 1996 by highly regarded Australian singer/guitarist Geoff Achison. Achison is an exciting guitarist who picked up the Albert King Award for most promising guitarist at the Blues Foundation's 12th Annual International Blues Talent Competition in 1995. One of the pieces he played there ("Train Ride") resurfaces here, fairly rattling along behind a version of Junior Parker's "Mystery Train." It is one of three original compositions here, which sit comfortably alongside a diverse collection of covers which runs from easy listening ("Can't Help Falling In Love"!) through to the more traditional Delta blues territory of Robert Johnson. Achison pretty much wears his heart on his sleeve in the way he interprets roots and blues music. He instills new life into older material such as Robert Johnson's "Walking Blues" and Elmore James' "The Sky is Crying"--probably the best track here--without ever detracting from the passion and intensity of the original. He is not afraid to look beyond the blues for influences either, which is perhaps best illustrated on "Chaser," where the guitar playing owes something to the flamenco style. The only other person I can think of who successfully achieves a similar hybrid style is Adrian Byron Burns. 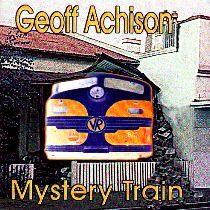 If you need an introduction to Geoff Achison, "Mystery Train" is a good place to start. It highlights Achison's soulful vocals and highly expressive guitar playing. Indeed, Achison's fretwork is so highly regarded that he holds the only Gibson guitar endorsement deal in the Southern hemisphere. To get hold of a copy of "Mystery Train" try contacting the Bottleneck Blues Club in the UK (www.musicinkent.co.uk/bottle or, after 1 June 2000, www.bottleneck.co.uk) or e-mail Red Lick Records (sales@redlick.co.uk). This review is copyright © 2000 by Gordon Baxter, and Blues On Stage, all rights reserved. Copy, duplication or download prohibited without written permission. For permission to use this review please send an E-mail to Ray Stiles.